Haig Dimple 15 Year Old is a common sight on European bar shelves, so much so that I would say it is the 15 year old blend I see the most of. So on the Continent, we know it for what is more or less its omnipresence; in America, it grabbed renewed attention for appearing on the Breaking Bad. 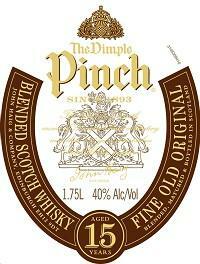 In the USA, it is labeled as Dimple Pinch rather than Haig Dimple, but Dimple is Dimple and the stuff in the bottle is the same. The name comes from the dimpled bottle design used by Haig in the 1880s or 1890s (reports vary), leading to the introduction of the Dimple 15 Year Old blend we know today. Reportedly, it contains a higher than normal malt proportion, including stuff from Glenkinchie and Linkwood. Yet as is the norm with the Scotch business, just how high "higher than normal" is, let alone how much comes from Glenkinchie and Linkwood, remains undisclosed.